Temperatures have dropped under zero this week. We are in the middle of winter. 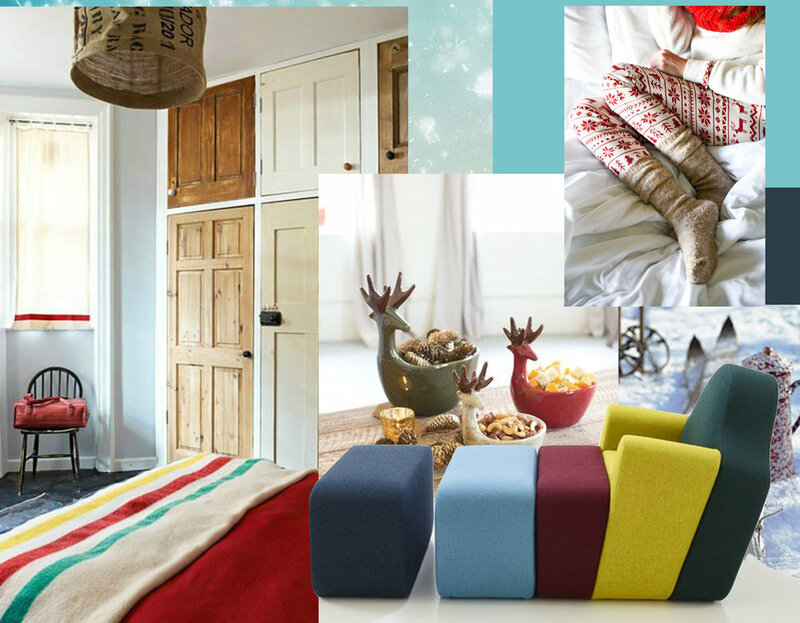 Today I'm sharing some winter color harmonies with you to give you ideas on how to decorate your home in this season. 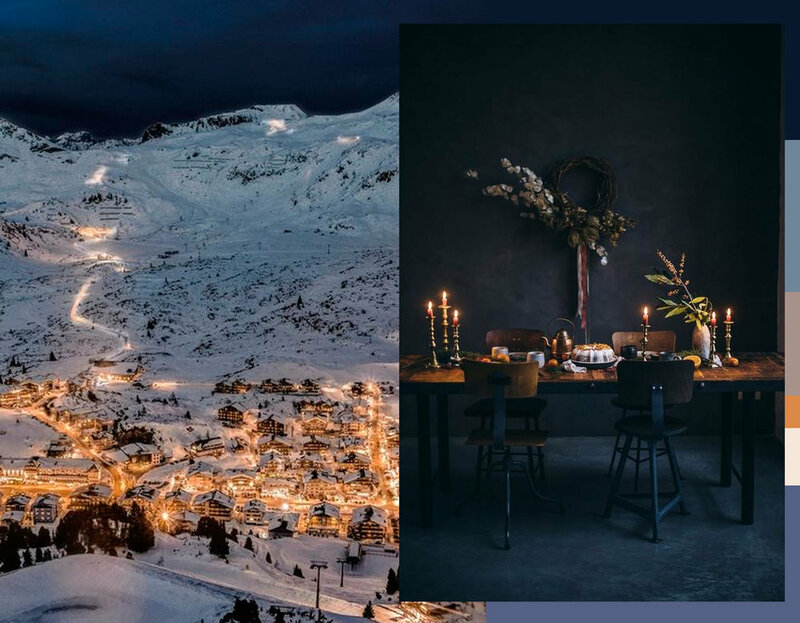 From very light, crisp pastels tone to a darker palet, inspired by a winter night in the mountains. Waking up in the morning and finding a landscape covered under a tick carpet of snow, got reality this week. Frosty windows will filter the sun light coming in. Blue sky and crisp air. 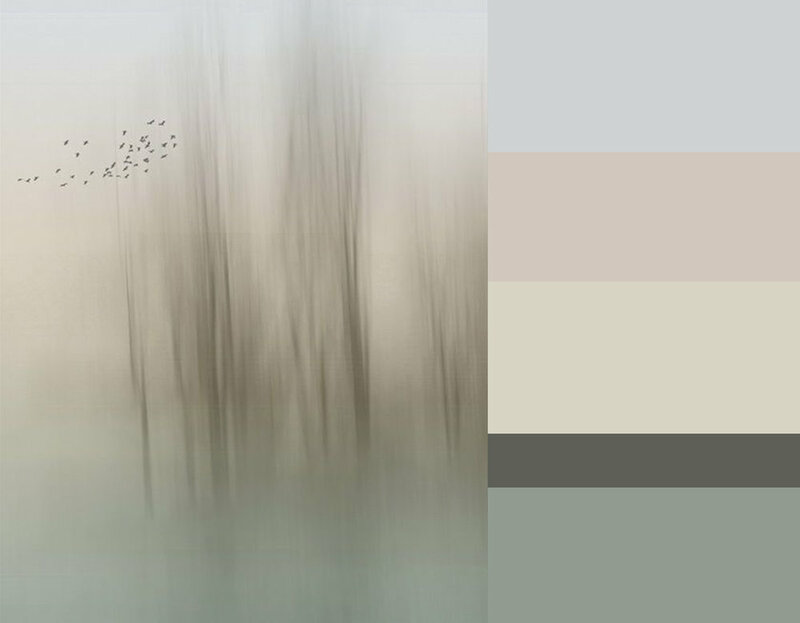 Winter pastels, a fresh color harmony. Combine them with white and light grey tones. Look at the deep white snow and let this inspire you for soft fabrics, heavy woven structures, and thick knitted bedcovers. "Simplicity is the ultimate sophistication", said Leonardo da Vinci. An interior in a color harmony of white doesn't have to be boring. There are hundreds of white shades. And you think white is a cold color? It all depends on the material. If you have a furniture with a white lacquered finished than yes, this is cold. But imagine a nice velvet, a cashmere pullover, heavy wrinkled linen, those reflect warmth. And combine it with natural wood for an inviting interior design. Wool felt, padded fabrics, blankets, open fire, candle light, cup of hot milk, furry fabrics..... all to bring you comfort in dark and cold times. 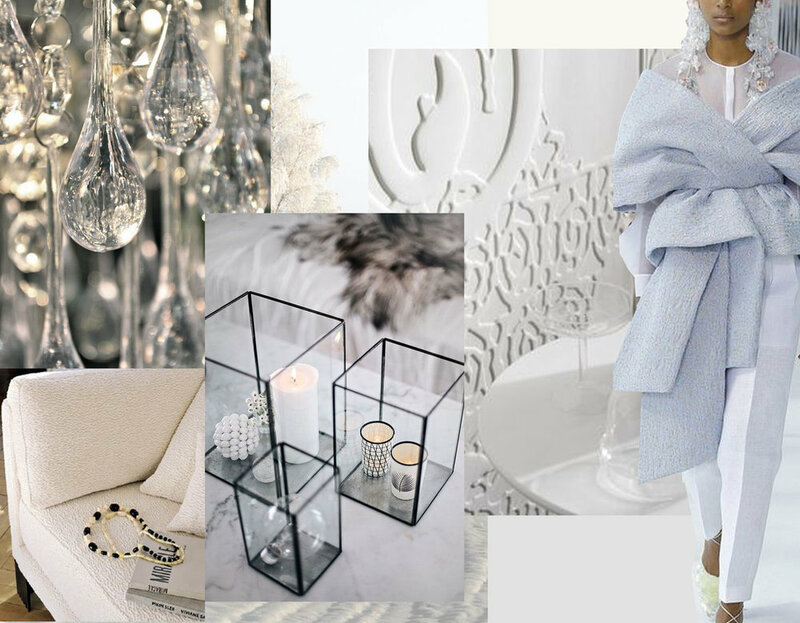 This color harmony can be very refined, candle light which reflect in crystals, modern wallpaper with a bas relief, fabrics for upholstery in heave weaves. Not every day in winter we wake up with a blue sky, there are a lot of other days when the foggy air slowly vaporizes, giving only a slight idea of what is behind. There is softness, no hard edges. Faded colors: a simple and sophisticated color palet, which at the same time can be kind of glamorous. There is a sense of yearning for calm and purity. The weather invites us to stay inside and find comfort. Not as in summer where colors can be bold and give us energy. 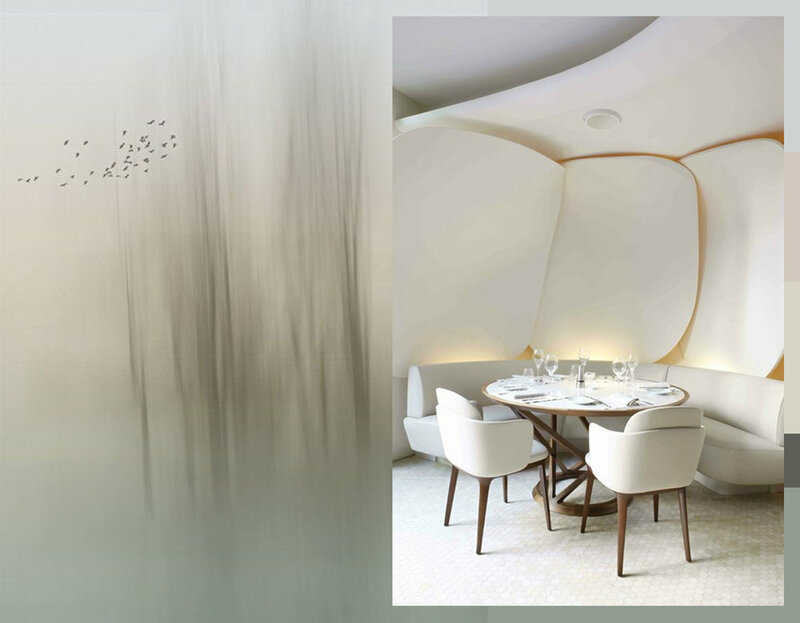 Soft shapes, natural materials. Winter season is the period for luxurious comfort, to indulge yourself with soft knitted throws, fluffy textures. Prints with an undefined pattern, faux-fur pillows in feminine colors. Wool rugs with a heavy woven structure. We go for soft accessories with extra comfort, cozy textiles. January and February don't have to be a grey and sad, let us create a positive vibe. We can use colors to brighten up the dark days, such as a Fairy Tale Blue and Pumpkin Pie form Benjamin Moore, or Terre d'Egypte from Farrow & Ball. We will create a cosy atmosphere in combination with some darker tones and neutrals. Is a bit a vintage color range, makes me think of the 1960's. An uncomplicated color range to create a fresh and young interior. There is a certain "fun" factor in this harmony, to break through the winter gloom. Go for simple shapes with colorful accents. Modern with a touch of tradition. We just have the holiday period behind us, nostalgic times with a lot of family gatherings, festivities. By adding some traditional style elements in your home you can bring back this family feeling. This can be an embroidered pillow, a striped blanket, some old fashioned ceramics, vintage elements. Touches of tradition can work well in both a city environment and country house. 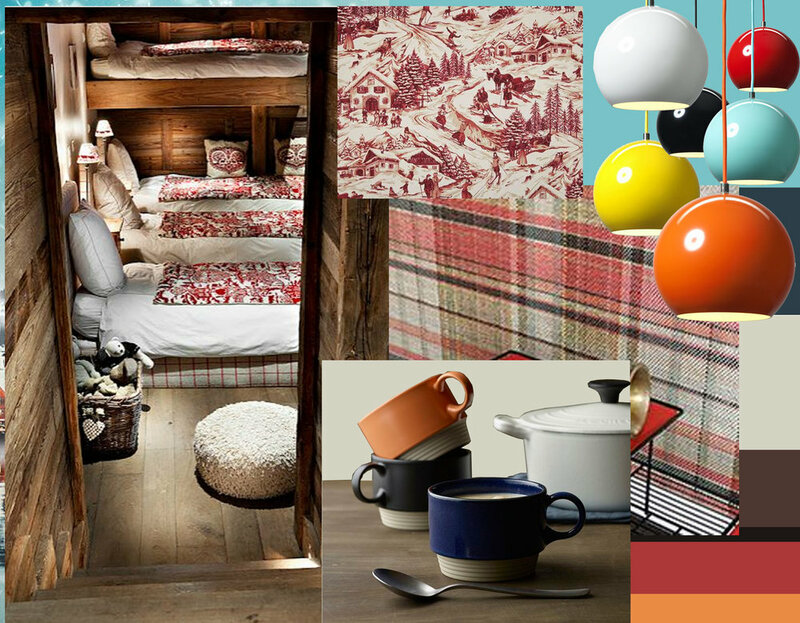 A wallpaper with a tartan, nordic influences, objects with a clear sense of the hand of the maker. Midnight blues to reflect winter's deep color harmony. Dark and moody with some vivid highlights. Colors inspired by a dark evening in the a mountain village. Deep dark blue tones, some light accents in amber and warm ivory tones as it would be jewel tones. The total look of this color range can look opulent and regal. It is time for shutting out the world and to indulge. To enjoy long evenings around the well decorated table. Dark colours in your interior will give a feeling of comfort, being protected from the world outside. A refined color range for an elegant interior. 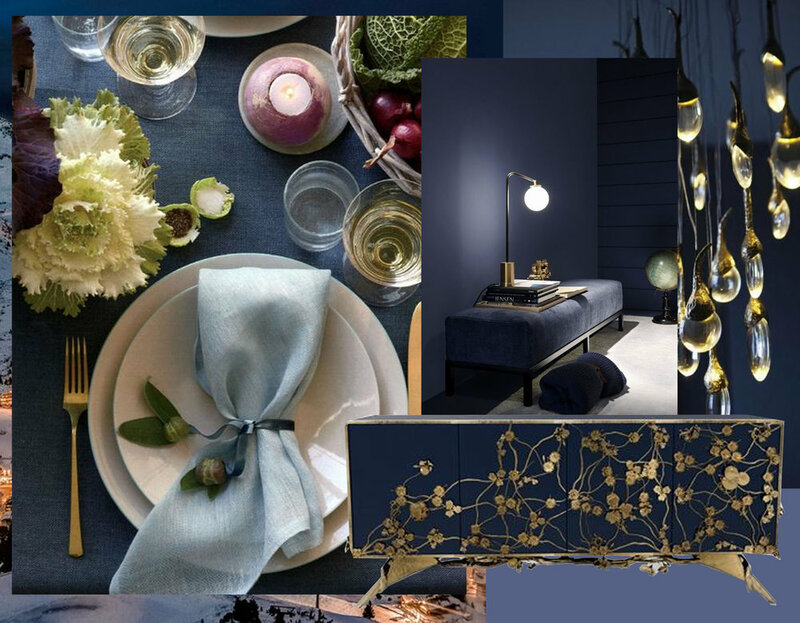 Imagine a nice cotton velvet in a midnight blue, candle light reflecting, some gold touches. And for decorating the table: take a look what you have in your fridge, nothing can be more decorative than adding some colorful vegetables of the season. Dark colors which fade away as the sun is coming up in the mountains, reflecting on the snow. Ombre wallpaper and curtains, sequins for your evening wear. Touches of luxury. Let me know your ideas, I'm curious.